While stone fruit continue to be plentiful I’m using them in lots of different dishes. 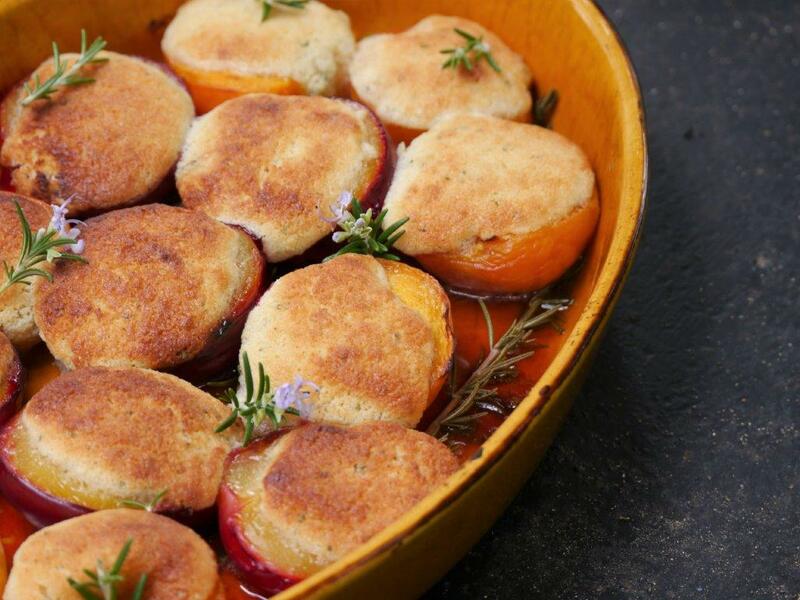 In last week’s recipe I grilled nectarines for a salad and this week I’ve baked plums and apricots for a dessert. Peaches and nectarines would also work allowing extra cooking time because the fruit are usually larger. Eden Orchards who are at both markets have great apricots, plums and nectarines direct from their South Island orchards. The fruit is all spray free so some fruit have marks on the skin but that makes no difference to what’s inside. Heat the oven to 200°C. Grease a baking dish liberally with the knob of butter. Place the halved fruit in the dish and drizzle with honey. If you want to, tuck a sprig of two of rosemary around the fruit. This gives a more intense rosemary flavour. Bake for 10 minutes. Remove from the oven and cool for a few minutes. In a bowl mix together the ground almonds, sugar, butter, orange blossom water, liqueur and chopped rosemary. Place in the fridge or freezer for a few minutes so the mix firms up. Put a spoonful of the mixture into the cavity in each plum and apricot. It will spread once in the oven so don’t add too much. Bake for 5-10 minutes or until the almond topping is golden. Serve warm or at room temperature with plain yoghurt, crème fraiche or ice cream. Alternative – for a different flavour, replace the rosemary with orange zest and use an orange flavour liqueur.